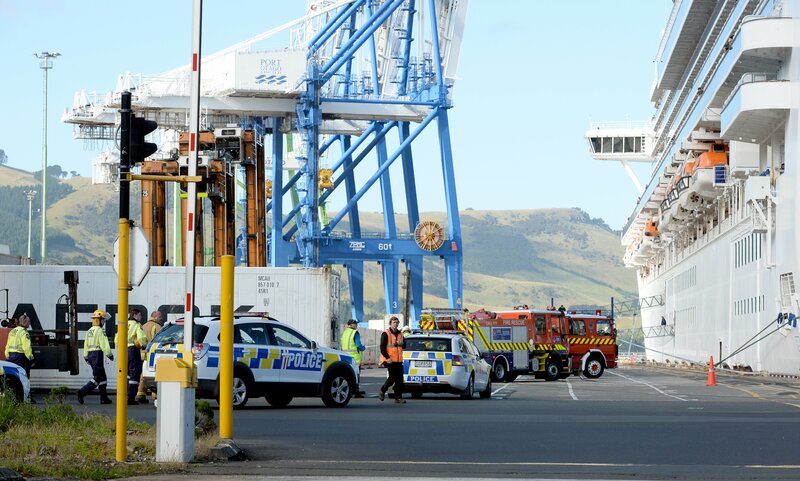 A fatal explosion on cruise ship Emerald Princess in Port Chalmers two years ago has prompted warnings international standards are urgently needed when it comes to maintaining, inspecting and testing nitrogen cylinders. A final Transport Accident Investigation Commission report into the accident on February 9, 2017, was announced yesterday. Emerald Princess, operated by the Bermudan-registered firm Princess Cruise Lines Limited, was docked at Port Otago when the vessel's crew members were tasked with checking the pressure of nitrogen cylinders. The cylinders were used to launch lifeboats in the event of an emergency. Allan Alarde Navales and Bernabe Santos carried out the maintenance work on boat 24, filling the canisters to the required level. After a minute of operation, one of the cylinders exploded and Mr Navales, standing beside it, was killed. The commission found the cylinder - and several others - were "not fit for purpose", despite being tested by a technician about two weeks before, and should not have been in service. "The circumstances of this accident raise the question of whether the current training requirements for authorised technicians are adequate for a pressure vessel stored in a harsh marine environment," the report said. "The commission also found that there is an urgent need for consistent and proper standards to be developed at a global level for maintaining, inspecting, testing and, where necessary, replacing high-pressure cylinders associated with stored energy systems on board ships." At present, there are no global standards that can be applied to the inspection and testing of the cylinders. The ship's operators, Princess Cruise Lines, appeared before Judge Kevin Phillips for sentencing last November after pleading guilty to a charge under the Maritime Transport Act. Prosecutor Dale La Hood said Mr Navales' family lived in poverty in the Philippines and his wages were a significant crutch for them. He told the court the victim had a sick mother, a sibling with an intellectual disability, one with a hole in their heart and a sister who was now caring for two children alone. Judge Phillips' decision was reserved. The charge carries a maximum fine of $100,000 but the judge could award reparation outside that. The commission said severe corrosion reduced the cylinder wall thickness from about 4.18mm to 1.45mm. Hydrostatic pressure testing of the cylinders on board Emerald Princess was scheduled to be carried out every 10 years. Since the cylinder was manufactured a year and five months before it was installed in 2007, the commission found it was overdue for the test by about 17 months - and a test back in 2015 would "very likely" have led to the cylinder being condemned and the accident avoided. The commission has made new recommendations - one for the manufacturer to improve training for marine surveyors, and one for Maritime NZ to go to the International Maritime Organisation safety committee to raise the implications for maritime safety of not having adequate minimum standards for the inspection.